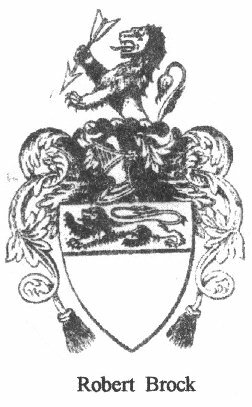 The Brock family have been associated with Upton near Chester for nearly two centuries (1500-1734) - as one of the families titled Lords of the Manor of Upton - the other family being the Browne Family. The Brocks became the biggest landowners in the Manor through renting the Manor from the Dean and Chapter of The Cathedral of Chester and through marriage. During this period there were 8 Williams, 5 Roberts, 4 Edwards and 6 Elizabeth's (2 through marriages), making research on this family difficult. Ormerod’s family tree of the Brocks is flawed as he had an aunt shown as a child of her nephew. 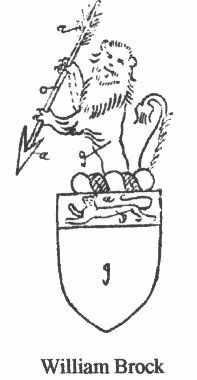 Earwaker in his family tree of the Brock's shows a William of Upton Gentleman and a Robert as being Archdeacon of Middlesex and Chaplain to Henry VIII. (the author cannot find any evidence from modern research of Robert ever being associated in the diocese of Middlesex). It is also difficult to trace the early history of the Brocks as the early records of the Cathedral have been lost or destroyed. The records of the Manor of Upton state ‘ that Upton was held by fee farmers’, at the time of Elizabeth but the Brock's were never farmers nor were they " landed gentry" although they had aspirations to that level. They were as some historians call ‘Middling People’, meaning that they associated and had business dealings and were part of that social circle - as can be gathered by the marriages. There are two Williams as being of the "Inner Temple" and both were called to the "Bar". Other records show that all the family dealt in land and property over the two hundred year period. The Will of Robert Brock, Alderman of Chester states that he held land and property in Upton, Newton, Moston and Moreton in the Wirral along with Houses in The Northgate and Pepper streets in Chester. The family also held land in Edge and North Wales. He was buried in Chester Cathedral. The Brocks also played a prominent part in Chester as Aldermen and Councillors of the City as well as Churchwardens of St. Mary's on the Hill - the parish church of the largest part of Upton until 1854 when the present church was built. During the Civil War the fortunes of William Brock changed as there was not a single property in Chester that had not been damaged or destroyed and Upton Hall ( which was in the fields opposite The Frog) , was occupied by Parliamentarian troops to stop food being taken into Chester during the siege. This Hall was burned down so in 1652 when William Brock's land had been sequestrated he went before the ‘ Committee’ to appeal if he could sell his land in Moreton since he was living on the charity of his mother and brethren. After the Civil War William Brock was offered a knighthood by King Charles II as were many people at that time. William refused the honour preferring to pay the £10 fine - this was a normal procedure since this was one of the methods the King used to raise money and people found it cheaper than the expense of clothes and travel to London. Later in the 17th century William was renting out property in Upton. In 1680 he rented a cottage and land to a William Healey and Mary his wife for the period of three lives. Then in 1682 he rented Demage Cottage to Thomas Ithell and Margaret his wife for the period of three lives. Thomas later bought the property and ever since this time the Ithell family have been living in or near Upton. In 1685 William rented the "Portfield" along with a house and a ‘smithy ‘ to a John Davies – a Tailor. The Portfield is roughly the piece of land that holds the "Egerton Arms" the shops at the Bache along Upton Drive up to Bache Drive down to Liverpool Road and back to the Egerton Arms. The Brocks were inter married several times - on three occasions to the Gregge family of Bradley and the Hurleston family of Picton. William Brock married a Catherine Gregge of Bradley Hall and went to live at the Hall and became known as William Brock of Bradley and Upton. On his death (this William is buried at Grappenhall).Catherine inherited Heath House in Upton (which is now the site of Upton Grange - an ancient site - a moated house at onetime and possibly dating back to medieval times or even longer). Their daughter and son in law rented the property. William Brock born 1643 married Susannah Hockenhull of Shotwick . This William was a Councillor and described ‘ as a man of the law’. They had seven children, four boys and three girls of which three children died. On William's death Susannah married a William Delves of Bowden. One of the Elizabeth's married William Hurlestone and they lived in Upper Upton Hall which is on the site of the Upton Golf Club building. Some of the garden wall and gate still exist today. Their eldest son William born 1676 became Sherrif of Chester and he married Elizabeth Hurlestone. They had six children including two boys , one died early in life and the other the son and heir died aged 19 years. He was taken ill while visiting friends in North Wales; returned to Chester by carriage and died at 5 St John's Street, Chester. The eldest daughter Elizabeth married John Egerton of Oulton and it was through this marriage that the Egerton family became Lord of the Manor of Upton. The remaining three daughters never married and so it is to the last daughter Susannah that the memorial in St. Mary’s Church is dedicated.